With over 600 varieties of heirloom, or old-fashioned, tomatoes in existence, and countless hybrids offered by seed companies, you have your pick of just about any size, shape and color tomato you can imagine. 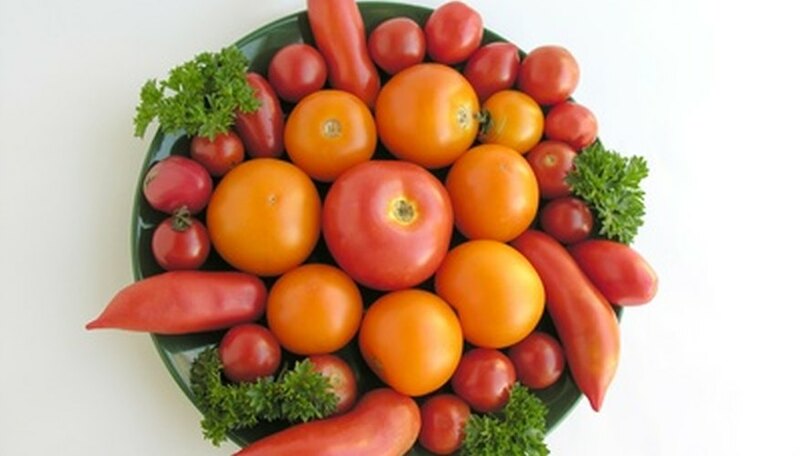 Tomato varieties fall into several categories, ranging from tiny cherry tomatoes to giant beefsteaks. For making tomato sauce or spicy salsa, a paste, or plum, tomato is best. If you want an unusual color with old-fashioned flavor, choose an heirloom. Small cherry tomatoes vary from the tiny Sweet 100 variety to larger pop-in-your-mouth tomatoes such as the Chadwick. None of the cherry types weighs more than 2 or 3 oz. Tiny Tim, Cherry Gold, Small Fry, Peacevine, Yellow Canary, Red Currant and Thai Pink are other cherry tomato varieties. Cherry tomatoes are ready for harvest sooner than the larger varieties, often within two months of setting out plants. The common Roma tomato is often available at grocery stores and farmer’s markets. It’s “rich and meaty,” as described by Seeds of Change, with fruits that weigh up to 3 oz. It has long been used in tomato sauces and pastes and is a good tomato for drying. Other paste and plum varieties include Ropreco, San Marzano and Black Plum, which won the 2002 tomato taste test, TomatoMania, in Los Angeles. This heirloom type is dark mahogany colored with green stripes at the stem end. It produces an abundant crop of sweet and tart 2-inch fruit. Grape types of tomatoes are small, oval shaped and have less water content than other varieties. The heirloom called Sweet Olive was also a winner at the 2002 TomatoMania competition. Its vines are compact, yet productive, and fruits weigh 1 to 2 ozs. Other grape types include varieties called Elfin, Tami-G, Chiquita, Green Grape, Agriset Grape and Red Grape. Maglia Rosa, from Italy, is an egg-shaped heirloom tomato with fruits weighing up to 3 oz. The hybrid known as Early Girl, which can grow as large as 6 oz., was developed by Burpee Seeds and is a common backyard variety. Another Burpee tomato that is medium sized is the 3 oz. Ensalada hybrid, which is recommended for salads. Sunset’s Red Horizon is an heirloom that produces pear-shaped fruit measuring 4 to 6 inches across. The Creole is the Louisiana state vegetable, with firm flesh and texture. Celebrity tomatoes can weigh up to 8 oz. and are good for use as a sliced sandwich tomato. The beefsteak varieties of tomatoes can sometimes grow larger than 2 lbs. Some beefsteak varieties are Big Boy, Better Boy, Chocolate Stripes, the dark-colored heirloom called Carbon, the Russian heirloom Black Krim, Aker’s West Virginia, Beefmaster, Brandywine, Aunt Ginny’s Purple, Big Beef, Brandy Boy, Andrew Rahart’s Jumbo Red, and Giant Belgium, which can produce fruits up to 5 lbs. Beefsteak varieties usually grow on determinate plants, which produce most of their crop in one burst, with a few more fruits ripening later in the season. Fine Gardening: What&rsquo;s the Best-Tasting Heirloom Tomato?